Found! The Real Mount Sinai! Christians and Jews have long searched for the real Mount Sinai. But is it the location discovered by Helena, the mother of Constantine in the 4th century AD? Most people think it is not. George Potter, an LDS researcher has done a lot of research in the Middle East and thinks he may have stumbled upon the real Mount Sinai. George: If you open up your Bible maps from the English version of the King James, published by the LDS Church, go to the maps in the back. You clearly see that Midian was not located in the Sinai Peninsula. Jethro lived in Arabia. Even today on maps in Arabia you see the town of Ugabe, which is translated as Jethro in English. Jethro lived in Arabia when Moses fled Egypt, he went to Jethro’s, and that was in Arabia. He was tending his sheep on the back side of the wilderness, it says. So, in other words, he was probably on the back side of the inter-side of the mountains that run through Midian. That’s where he was herding Jethro’s sheep at the time, and that’s where we believe Mount Sinai is found. For him to have been in Jethro’s town, Midian, which is still there, the ruins of Midian, to have been in the Sinai Peninsula, he would have been a very lost shepherd, believe me. When you get over there to where Mount St. Catherine’s is, anyway there is no evidence whatsoever that place was ever Mount Sinai. There is no fodder for sheep. There are no artifacts that have been left there. The only reason that was ever claimed to be Mount Sinai was that I guess Constantine’s mother went down there with some kind of a guru at the time and they said this must be Mount Sinai. But there is no evidence archaeologically that was ever Mount Sinai. We are travelling down this wadi and they said here is where we ended our fourth expedition looking for Mount Sinai. We’re going beyond this. We didn’t go more than a mile until we actually came to the artifacts that were described as being from this candidate for Mount Sinai. The first one is a natural feature. It is maybe kind of a circular type of little plateau. The circumference is probably 200 feet. On top of this feature, there is a sacrificial—it is not an altar, but it is a place where they would have sacrificed animals. It is a heathen—it is the same kind of feature you would find at Petra: the Nabateans. It’s a basin. It is a little kind of canal where the blood would flow into the rocks. So, that is on top of the little natural feature, but all around it are petroglyphs of calves, Egyptian-type calves. So that has become known as the Golden Calf Altar there. If you continue down the wadi, there is a mountain in the west and maybe 50-100 yards from that mountain, you will find eleven different piles of stones with holes in them that you would have put maybe a banner in, a flagpole or something. They separate the main area of the wadi, the valley, where people would have camped. Then you have these eleven different pole markers. They stretch maybe a mile and a half down. Those we believe are the border markers that Moses was told to separate the people from Mount Sinai so they didn’t accidentally wander on to the mountain. George: So, they are the border markers. They are still there. Then if you can get through the antiquity fence, you will find that there is what they call the Altar of Moses, which is kind of an L-shaped feature. It is maybe 100 feet long. We will also talk about its ties to the Book of Mormon. George: To give your followers a little bit of a background as to how we came across what is believed to be the Valley of Lemuel. If you look at any church publication now about the Book of Mormon and Lehi’s trail, they are following the photographs of us, or they are making pictures of what we believe to be the Valley of Lemuel. But how did we find that? It takes us back to Mount Sinai. When I got there, I found out there had been a group of four different LDS parties who pre-dated me, had gone looking for Mount Sinai. You’ve got to understand that there is a mountain range that runs down the entire length of Arabia, the western side of Arabia. There are tens of thousands of mountains there. How do you find Mount Sinai when there are all these mountains? It is like the Rocky Mountain range or the Sierra Nevada. I mean which one is Mount Sinai? It seems kind of crazy. If you would like updates on George’s work, subscribe to his free newsletter at https://www.nephiproject.com. 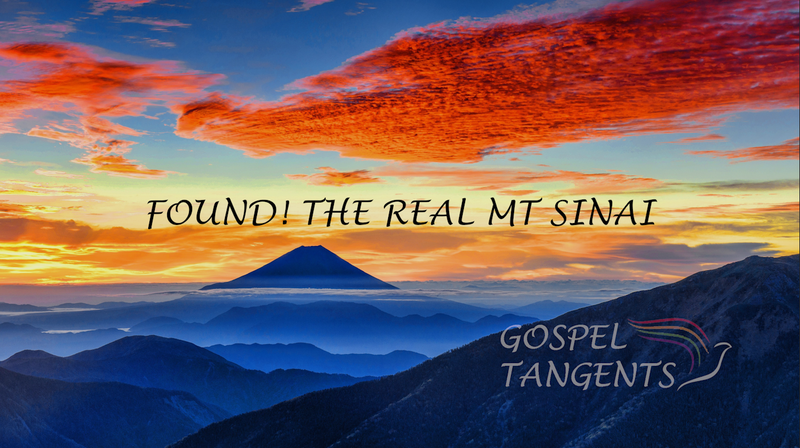 Check out our conversation…..
George Potter thinks he has found the real Mount Sinai!